KAMPALA – The Director of the Uganda Police Band is dead. CP Josephine Kakooza 64, died this morning at Namirembe Hospital. Kakooza joined the force at the age of 16 and passed out on September 1, 1969, according to Police Spokesman Emilian Kayima. Kakooza served at the lowest rank, Police Constable for 13 years. She was promoted to corporal in 1982, to sergeant in 1983 and to Assistant Inspector of Police in 1993. In 1997 Kakooza attended the Junior Command course and in 2000, she was promoted to Inspector of Police. It was in 2004 that she was promoted to Assistant Superintendent of Police (ASP). In 2008 she rose to Superintendant of Police (SP) up to 2012 when she was promoted to Assistant Commissioner of Police (ACP). In 2014 Kakooza was promoted to full Commissioner of Police (CP). Reports indicate that she was rushed to hospital after suffering a hypertension attack. In 1973 the music guru emerged number one in the Police Force Weaponry training. In December 2011 she was appointed the first woman Director of Music in the Police force. Uganda Police posted on Social Media that Kakooza, nicknamed Mama Police, had breathed her last but Mr. Kayima said the post mortem was not ready, so they could not readily establish the cause of death. 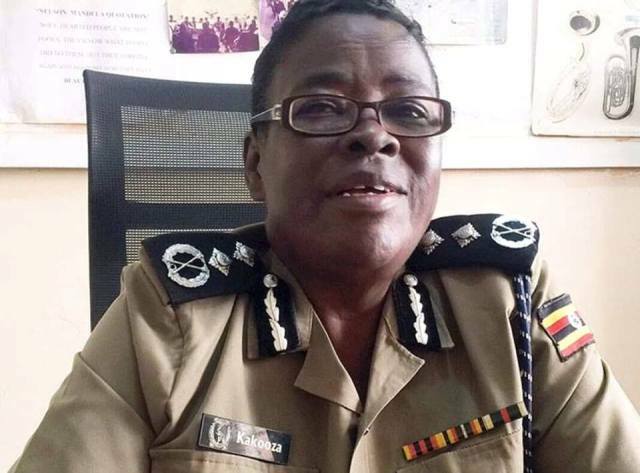 “May her soul rest in eternal peace and may God strengthen her family and the entire Uganda Police fraternity,” Uganda Police Chief Political Commissar, Mr Asan Kasingye posted on social media. Kakooza was born on June 8, 1953. “We are working with the family to know what her wishes were. We know she was Catholic but we need to work with the family to arrange for the burial,” Mr. Kayima responded to inquiries about the funeral arrangements.